Clinical Massage is designed specifically for massage therapists who need to learn more clinical/therapeutic applications for massage therapy. Detailed anatomical information is coupled with clinical treatment protocols that together address common muscle injuries and other soft tissue pain and dysfunction. The video demonstrates techniques in three different approaches: a compression, relaxation and deeper muscular sequence. These sequences include 90 detailed techniques which can be integrated to address your clients' painful conditions and complaints. Also discussed are contraindications, oil selection, draping and common mistakes made during a massage. Superbly informative course that I will refer back to as I integrate the material into my practice. It gave me that next level of understanding of anatomy for massage that I was looking for due to the detailed and thorough writing. It also updated me on the latest research in the field of massage and answered lingering questions I had from massage school about a range of topics. The only thing I would like to have seen would be more video materials to see the techniques in motion. Wow! I did not expect to learn so much! this was a great review of the muscles and how to address them. I loved that I could review the test and answer the question as I went along. I actually learned more doing it that way! This course more then met my expectations. I have been in practice 17 years and hove done much treatment work but this class added much to my knowledge. It was also great for refreshing some things that I had forgotten. I was moving away from treatment work, doing more relaxation, but now I feel more confident to continue with treating some specific problems. The anatomy pictures in the book were very, very helpful. Thank you. Before finishing the course, I'd already started putting the ideas into practice, and I had one of those weeks: four clients came back within two weeks for more! My expectations, which were great upon ordering based on prior comments, were exceeded. This course was the tie-in I needed between knowing the muscles and their functions, and helping my clients to heal through massage therapy, and educating them. I am surprised that an on-line course could be so effective! Thank you. This is one of the best books I have ever seen as far as showing the muscles. I am glad I chose this course for my first CEU course. I believe this book is going to help make me a better therapist (muscle wise). The video is just great. I love how they show 3 different routines - these will surely help my clientele. The book is absolutely amazing! Myself and the other MT's at the Center where I work were VERY intrigued by the photos, and the explanations gave me new insight to the body. Thank you very much! I will continue to get my CEU’s through IIHS, as it's very convenient for me. I enjoyed this course thoroughly. The information was well presented and the book's pictures were amazingly helpful. The information I obtained will be helpful in my personal practice as a massage therapist, and I will definitely use the book and video at later dates for additional information. I was very happy and impressed upon opening the package to find everything I needed with book and DVDs. I have shown the books to other therapists and they also were very impressed. I will use this as a reference book throughout my career to explain to clients and patients' treatments I will be performing. Thank you! This is the first text I've chewed on from front to back because I can see and understand how to integrate treatment of each muscle and fascia into my practice. Excellent photography and overlay of muscle/fascia coupled with step-by-step treatment helped me make sense of muscle's I'd forgotten I knew about. Clients will benefit too from the wonderful photography and illustrations in understanding their conditions. Applying techniques from Donna Sunday's text and video, I immediately began receiving feedback from clients on the effectiveness. Examples include, 'I don't know what you did to my head, but I relaxed in 2 minutes instead of 30.' 'Magnificent! Can you memorize that hour and repeat it?!' 'That slow, deep work you did is the best I've ever had; what kind of massage do you call that?' Clinical Massage has opened a new chapter in my practice, and this was exactly the course I was looking for to help me address specific conditions I see daily. Thank you for the best CE course I've ever taken to date, one that is already helping me facilitate freedom from pain. 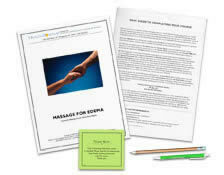 Basic Clinical Massage Therapy is an excellent text, which I will refer to often. The course exceeded my expectations. Great course! Was able to complete the test quickly and the book is incredible with great pictures for reference. Definitely will use this book yearly. This course was very in depth and yet maintained the ability to be understood and comprehended. I found this course to be extremely educational and informative. The content and photographs provided a unique learning experience. The accompanying manual and CD enhanced this material. The entire contents will be a valuable reference guide throughout the rest of my career. Thank you for making this course available. I was very impressed with the quality of the text book.. very well written and easy to understand. The pictures are awesome. This course was very interesting and I can't wait to be able to incorporate the new knowledge into my practice and hope I can help my future clients. This was one of my favorite online courses I've ever taken in the 13 years of being a massage therapist. The textbook is incredibly informative with detailed images that I will find very useful as a reference in the future. This workbook is superb to say the least. I love the illustrations of muscles and muscle groups. This is going to be a good “go-to” book when I need help. I have been working for 15 years as a massage therapist and had to take a leave to care for my parents. This book/ course “awakened” my knowledge. Enjoyed the course and it helped to refresh information. This is the best CEU I have taken! Extremely informative and had great practical applications. I always like my courses that I have taken here. I really like the book, which provides much more applicable information that I can use in my practice, not only just anatomy and academics. Really appreciate the applicability and the thoroughness of the reference materials. The course provided information that I found very helpful and informative about specific conditions that massage therapy can play a vital role in. This was a great course. I recommend taking it. I especially liked the scenerios and questions. Very informative course. This exceeded my expectations as a home study course. It was very beneficial to not only read the content but also see the techniques being discussed! Great book, good course, alot of information. Love the book and it's layout and explainations. This will definetly be an excellent reference guide for my work. Excellent information! The pictures were exceptional and the wording was easily understood. The material and video are very useful and well put together. Great course! This is the best textbook I've seen. It will soon be as worn and used as my copy of 'The Anatomy of Movement'. The accompanying hard copy is excellent to refer to - and best I have purchased. The video was the best one I ever purchased. The Best! Excellent text, which I have already and will continue to use in my practice. Thank you for obviously so much thought being put into its preparation.